In the last five years, USAID has pioneered a new model of development that harnesses the power of business and innovation to end extreme poverty and promote resilient, democratic societies. Finding New Ways to Bring Capital to the Developing World. In emerging markets, eight out of 10 small businesses cannot access the loans they need to grow. USAID’s Development Credit Authority (DCA) helps fill this gap, using risk-sharing agreements to mobilize local private capital. Mike Muldoon, DCA Investment Officer, reflects on DCA hitting a new record: reaching 54 transactions in one year and making available $769 million in capital through guarantees. He says, “Our tool can be called on regardless of sector or environment—regardless of whether we are working in an undeveloped market like Cameroon or Sierra Leone or a comparatively more developed market like Nigeria or South Africa.” Read the full interview. Supporting Civil Society. Essential to USAID’s mission is assisting countries in making the transition to resilient, thriving democracies.Urim Ahmeti, team leader for the Democracy and Governance Office in Kosovo, reflects on USAID’s work helping Kosovo’s civil society boost demand for accountability in this new nation after its declaration of independence in 2008. Ahmeti says, “This period—the birth of my country—is very memorable to me and an entire generation. It is a point in history that will never be forgotten.” Read the full interview. Fighting for a Strong Leadership Voice. 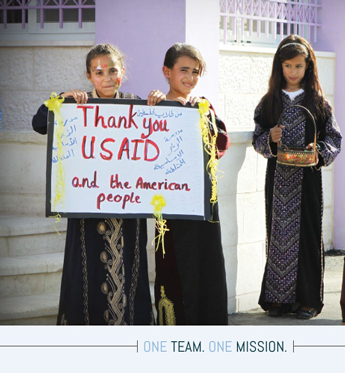 A development agency that is strong, empowered, and accountable is necessary for achieving USAID’s mission. Carla Koppell, Chief Strategy Officer, shares her thoughts on the revitalization of the Agency, its brand, and its role in foreign policy. She says, “We are integral to U.S. foreign policy, and we will continue to proactively promote that agenda.” Read the full interview. Celebrating Our Staff as National Heroes. 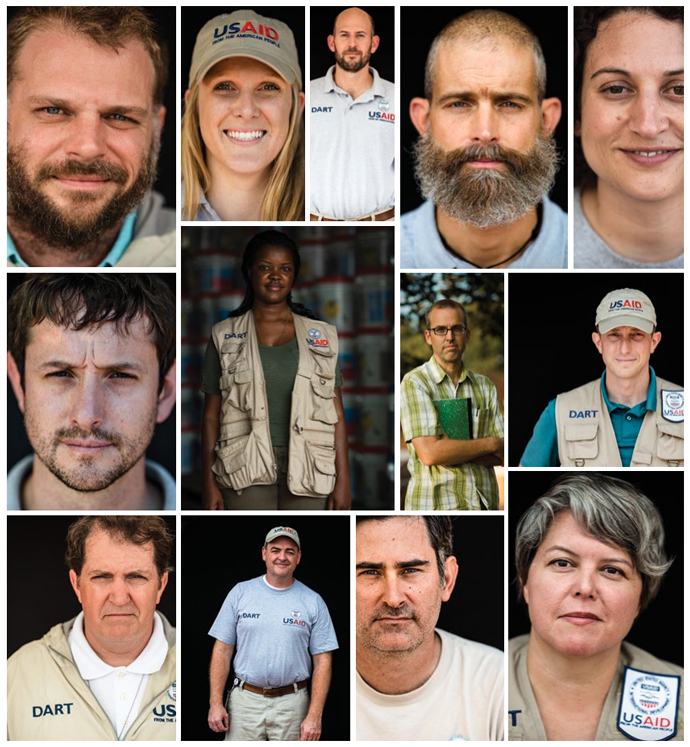 From Typhoon Haiyan, to the ongoing Ebola crisis, USAID staff are often called upon to lead responses to the world’s greatest challenges. Captain Colleen Gallagher, Navy Liaison to USAID, Office of Civil Military Cooperation, speaks about being deployed to Haiti immediately after the earthquake on a hospital ship—the USNS Comfort. As aftershocks rocked the giant ship, Gallagher persevered each day by meeting with a USAID team to coordinate the avalanche of incoming trauma patients. She says, “By the end of that first day, we went from a census of zero to 80 patients—most of whom had significant trauma.” Read the full interview. In a time of unparalleled need, the response from our nation’s humanitarians and our partners has been inspiring. Children and their families trapped on Mount Sinjar in Iraq are receiving U.S. military airdrops of food and water. In South Sudan, life-saving supplies are arriving by air to vulnerable communities cut off by violence. 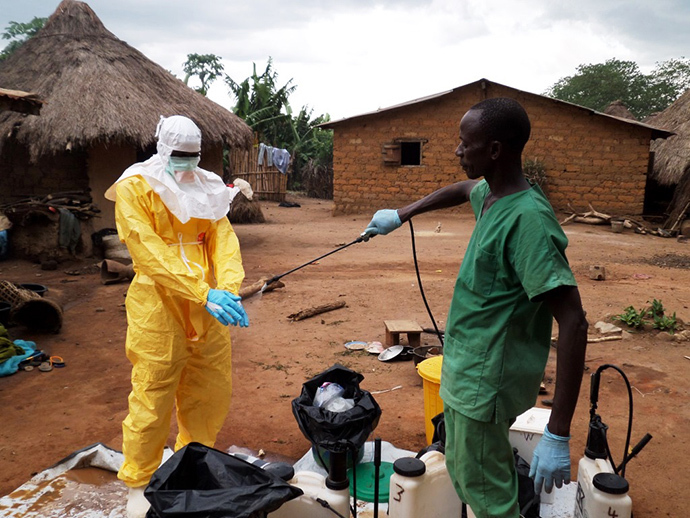 In West Africa, health workers are fighting the Ebola virus, even at great risk to themselves. And in the refugee camps on the Syrian border, we’re getting children into school so that this devastating crisis doesn’t rob them of their future. 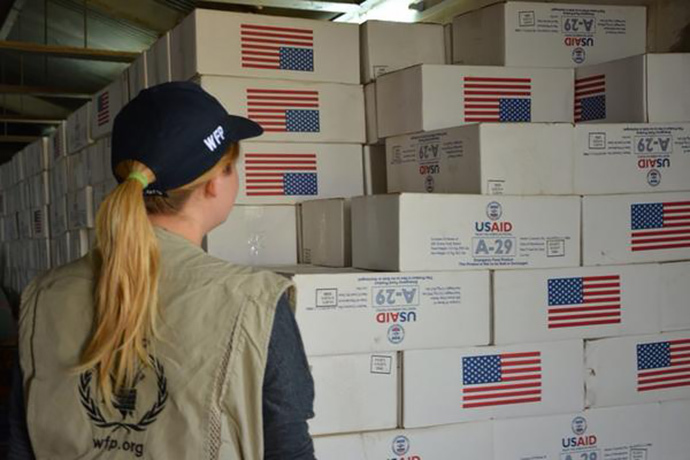 From the Central African Republic to Gaza, from Burma to Yemen, millions of vulnerable people are relying on the life-saving assistance that the United States and our partners provide. 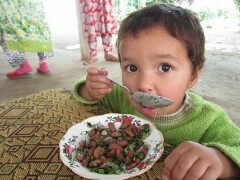 Food to revive malnourished children. Hygiene kits to stop the spread of disease. Safe spaces for children to laugh and play. This is the first time in our Agency’s history that we have been called on to manage four large-scale humanitarian responses at once—in addition to reaching other vulnerable populations worldwide and preparing communities ahead of natural disasters. We are not working alone. We are grateful to our U.N., NGO, and local partners, who have demonstrated exceptional fortitude and compassion in the face of relentless tragedy. They are epidemiologists who have flown into the epicenter of one of the world’s deadliest diseases to help track its spread. They’re logisticians who are coordinating with the U.S. military to airdrop food and water to families stranded on Mount Sinjar. They’re engineers who have helped design displaced persons camps so that women and girls can walk around at night without risking their lives. They’re doctors who are staffing clinics where children have arrived riddled with shrapnel or wasted by hunger. Today, we are able to equip these heroes with new tools and technologies that have dramatically improved our emergency response, including satellite maps to forecast the risk of famine in South Sudan and debit cards that enable families to shop for their own food at local stores in refugee camps on the Syrian border. These crises are far from over. We will continue to work closely with our essential partners, especially our fellow donor nations, to do more to save lives and foster lasting solutions. Despite the challenges, we remain committed to providing help in an emergency—regardless of danger or difficulty. It is one of the most profound expressions of who we are as the American people. If you would like to contribute, I encourage you to make a monetary donation to a reputable humanitarian organization already working on the ground. Nothing will get there faster or help more. 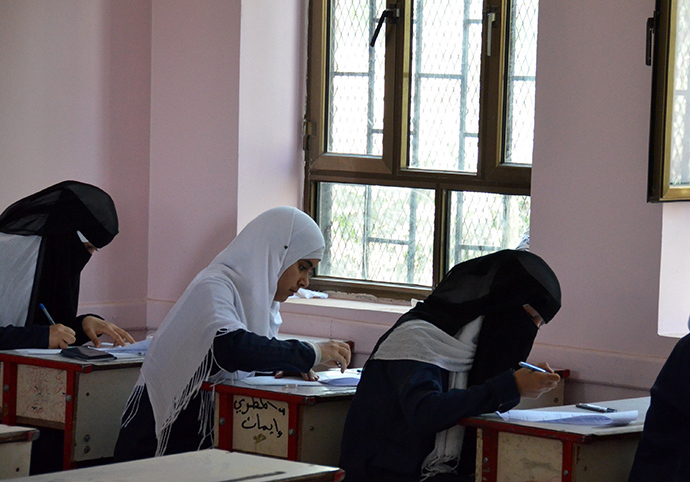 In certain parts of the world, how many things have to go right in order to get a girl into a classroom? And what type of life can that education can provide her? As the senior gender coordinator for USAID, these questions fill my mind constantly as I seek to carry out my mandate – helping empower women and girls to participate fully and benefit from the development of their societies. Last month, I traveled to Zambia, Sierra Leone, and the Democratic Republic of the Congo with Dr. Jill Biden, USAID administrator Raj Shah, and Ambassador-at-Large for Global Women’s Issues Cathy Russell where I was able to see them answered firsthand. The decision to allow a child to go to school is fraught with obstacles. Some are material: uniforms, socks, shoes, notebooks and pencils. Some reflect the economic and cultural realities of poverty-stricken families. But these concerns also often pale in comparison to the serious danger that many women and girls face every single time they step out of their homes to pursue an education. In the eastern part of the DRC, I met a young woman who was kidnapped from her own home and taken into the jungle for six months by an armed militia. She had no idea where she was, who had taken her, or if she would ever see her family or home again. 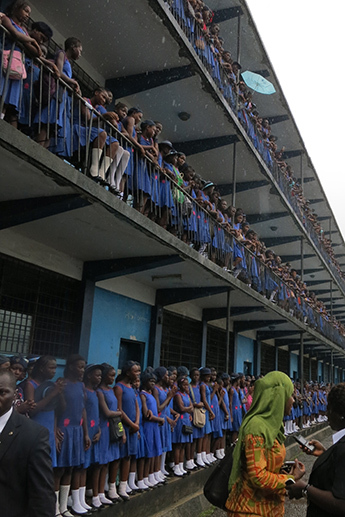 In Sierra Leone, I met two younger girls from a rural area, around 10 years old, who were given to an “Auntie” in the city with the promise that they would attended school. Instead, they were held hostage in her home and made to do all of the household chores with little food and water. They suffered for months until they finally managed to escape. 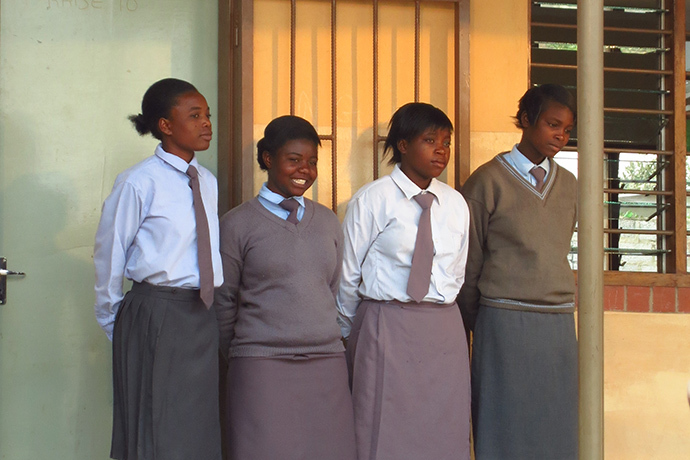 But in Zambia, a young woman named Martha, orphaned by HIV/AIDS, was still trying to find a way to stay in school. Despite extreme poverty, little existing educational infrastructure, and the loss of her parents, she explained how her greatest goal was to finish her education. In the DRC, Therese, an incredibly talented local entrepreneur who worked in restaurants for years, managed to save enough money for engineering school. With her degree, she created several surprisingly effective traffic robots that have become functional icons around Kinshasa. The robots are the centerpiece of her company, Women’s Technologies, that she runs alongside several other women. As if that weren’t enough, she also owns a successful chain of local restaurants. Everywhere I went, people seemed to intuitively understand that educating their daughters was the most important thing they could do for their future. They might not know the statistics: That an educated girl has a “ripple effect” in many ways. That a girl with an extra year of education can earn 20 percent more as an adult, or that a girl who completes basic education will invest 90 percent of her earnings back into her family. These effects might be invisible for the time being, but women, children, and community members are still willing to take great risks and make incredible sacrifices to stay in school, or to help their friends, daughters, and wives do the same. Whether or not we can see it now, these benefits amplify across families, towns, cities, countries and generations. This is why, in line with our mission to end extreme poverty and promote resilient democratic societies, USAID invests $1 billion every year on education programs around the world – on programs like WASH, designed to improve clean water and sanitation facilities in schools, and EAGLE, to help girls in the Democratic Republic of Congo make the transition from primary to secondary school. And to help raise awareness on the importance of girls’ education, we launched Let Girls Learn earlier this year with the help of our friends from the arts and entertainment industry. Ultimately, it is stories like the ones I heard throughout my trip that drove home the necessity of programs like these. We do this because around the world, from Afghanistan to Zambia, individuals and families understand that both the risks and the payoffs to women’s education are huge. Despite putting themselves in the line of fire, sometimes quite literally, mothers continue to send their daughters to school, and their daughters keep going. Teachers continue to show up everyday to pass on their hard-won knowledge and expertise to the next generation. Communities, on their own and with our help, continue to build the infrastructure, even though it risks destruction. The resilience and bravery of the girls and women that I met is humbling and inspiring. They certainly keep me going, and I’m glad that we are here to help turn that determination and perseverance into a lasting reality. Take a look at what USAID is doing in Zambia, Sierra Leone, and the Democratic Republic of the Congo. Eid Mubarak. As Muslims around the world celebrate Eid al-Fitr, we share our warmest and joyous wishes with them and their families. Earlier this month, we hosted our Agency’s 12th annual Iftar dinner. It was—as always—a welcome pause from our daily responsibilities and a reminder of the mission we serve. As President Obama said, Ramadan is a time for spiritual renewal and devotion—a chance to honor a faith known for its diversity and commitment to the dignity of all human beings. We came together in reflection at a time when our mission—and our values—are being tested. Across the globe, millions of children, especially girls, face daunting threats. Syrian children continue to endure relentless dangers, from barrel bombs to extremist militias. Girls in India risk their lives simply by fetching water or visiting latrines. Children in Nigeria attend schools that are targets for terrorists rather than a sanctuary for learning. Our work together is more critical than ever. Several years ago, we announced a new policy to put innovation and partnerships at the center of our work with women and girls around the world. To uphold that commitment, we recently launched Let Girls Learn, a powerful movement to call attention to the importance of investing in girls—in their education, in their health, in their potential. Every day, we work to put the power of science and innovation into the hands of those who live their faith and serve this common purpose—a message I shared when I spoke at the National Prayer Breakfast earlier this year. Today, in Nigeria, we’re helping get half-a-million children, including 250,000 girls, into school and actually learning. In Jordan, we’re providing emergency education to 150,000 child refugees—including 60,000 girls—who have been forced to flee violence in Syria. 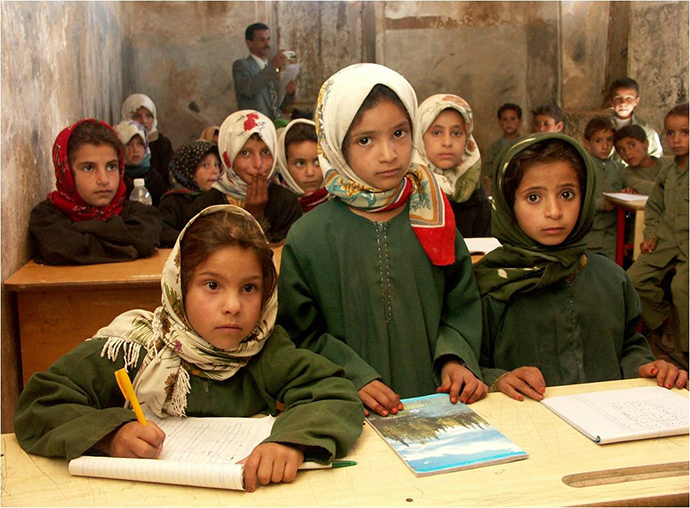 And in Afghanistan, 3 million girls and 5 million boys are enrolled in school—compared to just 900,000 when the Taliban ruled by terror. As we broke bread together at our Iftar, we were honored to hear from Parniyan Nazari, who spoke poignantly about her experiences growing up in Afghanistan under the Taliban. When girls were forbidden from attending school, she cut her hair like a boy. While they wanted to let her learn, the teachers told her that it could put everyone at risk​. She used faded books from the International Rescue Committee to teach herself, and today, she is leading Women for Afghan Women​ working to provide education for girls and women. ​Parniyan’​s story of courage and compassion inspires us to draw strength from her example as we work to end extreme poverty in our lifetime. This Friday, our Agency is proud to host the first official event of the African Leaders Summit—one that brings together a diverse community to highlight the importance of faith organizations in development. Called Faith Works, it serves as another meaningful opportunity to celebrate the values that unite humanity and inspire us to reach towards extraordinary goals. Tonight, 860 million people will go to sleep hungry. This year, 6.6 million children will die before their 5th birthday. And every day, 1.1 billion people around the world—more than the population of North and South America combined—live in extreme poverty on just a dollar-and-a-quarter a day. Even after adjusting for the relative price of local commodities, this is a desperately meager sum. With it, families must make daily choices among food, medicine, housing, and education. We know it doesn’t have to be this way. For the first time in history, we stand within reach of a world that was simply once unimaginable: a world without extreme poverty. From 1990 to 2010, the number of children in school rose to nearly 90 percent, and around two billion people gained access to clean water. Child mortality rates have fallen by 47 percent and poverty rates by 52 percent. In 2005, for the first time on record, poverty rates began falling in every region of the world, including Africa. We now have a clear roadmap out of extreme poverty that is driven by broad-based economic growth and transparent democratic governance. With the deadline for the Millennium Development Goals drawing near—and conversations on the Post-2015 Development Agenda well underway—the global community has an opportunity to pioneer a new model of development and shape an inclusive, results-driven agenda that will end extreme poverty. The Busan High-Level Forum on Aid Effectiveness has built a strong foundation for this effort—tapping into the capabilities of governments, foundations, companies, and civil society organisations to solve the world’s greatest development challenges. Through this new model of development, USAID is forging high-impact partnerships to harness innovation and scale meaningful results to end extreme poverty. This month, we launched the U.S. Global Development Lab, a hub of creative design and high-impact collaboration that is setting a new standard for development. Together with 32 cornerstone partners, the Lab will bring innovators and entrepreneurs from across the public and private sectors to answer the world’s most pressing development challenges through science and technology. Earlier this year, through our Development Credit Authority, USAID partnered with GE and Kenya Commercial Bank to help health care providers buy life-saving healthcare equipment, including portable ultrasound devices and Magnetic Resonance Imaging machines. For the first time ever, our private sector partner is covering the cost of the loan guarantee—making this program virtually costless for the taxpayer. President Obama’s Power Africa initiative is another great example. For most of the world, electricity allows businesses to flourish, clinics to store vaccines, and students to study long after dark. But for more than 600 million people in Sub-Saharan Africa, these opportunities simply do not exist. Power Africa encourages countries to make energy sector reforms—while connecting entrepreneurs to investment opportunities that are created by those reforms themselves. Less than a year since launching, more than 5,500 mega-watts of power projects have been planned—putting us more than halfway towards the initiative’s goal of expanding electricity to 20 million homes and businesses. Just recently, we celebrated three local engineers who are lighting up Africa with solar-powered generators and pay-as-you-go power home meters. Increasingly, the best ideas aren’t just coming from development professionals who have been in the field for three decades. They are also coming from scientists, inventors, and entrepreneurs around the world. That is why we launched the Grand Challenges for Development and created the Development Innovation Ventures fund—to enable problem-solvers to test their game-changing idea, whether it’s a mobile technology that boosts hospital efficiency or a $10 device that prevents the leading cause of maternal mortality. A few years ago, we were lucky if we got half-a-dozen proposals in response to our solicitations. So far, these new kinds of open competitions have received more than 6,000 applicants—each with the potential to transform development. Even better, 70 percent of proposals are from inventors who we’ve never worked with before. We look forward to strengthening this new model of development at the first High-Level Meeting of the Global Partnership for Effective Development Co-operation. Whether we work for a government agency or small local organisation, each of us can expand our emphasis on partnership and innovation. Each of us can deepen our focus on rigorous evaluation and scalable results. Working together, we can throw open the doors of development and engage millions of people in our mission to unlock a brighter future for all. This originally appeared on whitehouse.gov/typhoon. On November 8, Typhoon Haiyan—known as Yolanda in the Philippines—made landfall in the central Philippines, bringing strong winds and heavy rains that have resulted in flooding, landslides, and widespread damage. According to USAID, the storm affected an estimated 9.7 million people, and damaged or destroyed approximately 23,200 houses, as well as public infrastructure and agricultural land. Those numbers are expected to increase in the coming days as more information becomes available. Learn more about how you can help and the Statement from USAID Administrator Dr. Rajiv Shah on Super Typhoon Haiyan. 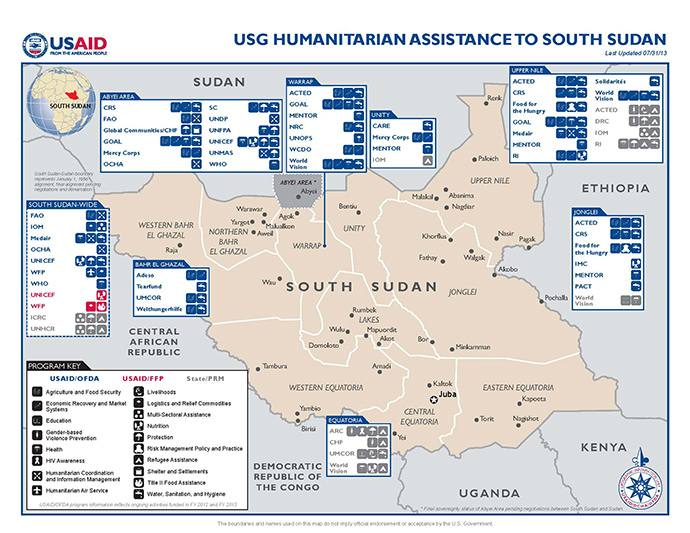 Click on the image view USAID’s latest fact sheet on response and recovery efforts. Click on the map to view areas affected by Typhoon Haiyan. On a visit to Rhode Island last month, I toured a factory called Edesia, where fifty employees manufacture a high-energy peanut paste to feed millions of starving children around the world. What is remarkable is that nutrient-packed meal did not exist ten years ago. It is the result of a decade of research backed by USAID to elevate the science behind creating foods that can restore severely malnourished children to health. America has always led the world in advancing innovation to deliver unprecedented legacies for humanity. Across our proud history, it is when we harness American science and entrepreneurship that we achieve the greatest leaps in social and economic development. For example, the Green Revolution pulled millions from starvation thanks to high-yield varieties of rice and oral rehydration solutions saved millions of children. 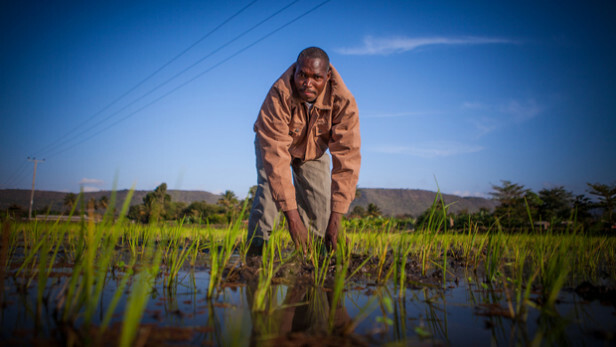 Americans can be proud of USAID’s history of embracing and then advancing science, technology, and innovation to create new solutions for age-old challenges. Today, we are building on this legacy with a renewed sense of focus and energy around the world. In the last year, twenty USAID missions (see box) have stepped forward to work hand-in-hand with university and private sector partners to harness science, technology, innovation, and partnerships to advance development goals. Imagine them as field labs where we will demonstrate the real impact of new, cost-effective innovations. That means working closely with local communities to invent, test, and apply groundbreaking ideas to help end extreme poverty. This is a real challenge. But it is achievable if we continue to reach out to the brightest minds on the planet to generate solutions to challenges like providing vitamin-rich food to children in crisis and producing affordable, renewable, off-grid energy. Through Development Innovation Ventures, for example, we’re investing in a team of young graduates who started a company called EGG-Energy to provide families with rechargeable batteries they can rent to power their homes for five nights at a time. In Tanzania, where 90 percent of people lack access to electricity—but 80 percent live within 5 kilometers of the power grid – this could help a generation of children grow up with light. Through mobile money platforms like the Better than Cash Alliance, we can accelerate financial inclusion for the 1.8 billion people with access to a phone but not a bank. Through Global Development Alliances, we’re leveraging private sector resources and expertise to help diasporan entrepreneurs in the U.S. grow their businesses. One such company, Sproxil, developed a prescription medication verification system using a scratch card on each pack of medication revealing a numerical code. By texting the code to a toll-free phone number, you can verify whether the drug is genuine or possibly fake. Today, thanks in part to a seed grant that Sproxil won through the USAID-supported African Diaspora Marketplace, the company has introduced its products in five countries where it reaches over one million consumers. Our Grand Challenges for Development offer innovators opportunities to apply their scientific and technological expertise to clearly defined development challenges. In the last three years, we’ve launched five challenges, and we have already identified many promising innovations, including the Pratt Pouch, which won our Saving Lives at Birth Grand Challenge. Designed by students at the Pratt School of Engineering at Duke University, this low-cost foil pouch – similar to a ketchup packet – remains stable without refrigeration and allows mothers who give birth at home or far from a clinic to give their newborns medication to prevent HIV within the critical 48 hour window after birth. We know that talent is everywhere, while opportunity is not. That is why our Partnerships for Enhanced Engagement in Research (PEER) is helping to level the playing field for scientists in developing countries. PEER is providing funding and mentoring support to developing country scientists working side-by-side with U.S. researchers who are funded by U.S. research agencies. Together, these scientists are addressing a wide range of development-related topics, including health, food security, climate change, water, biodiversity, disaster mitigation, and renewable energy. 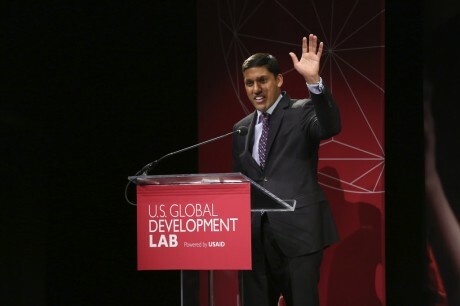 These are exciting times at USAID, and I’ve seen first-hand that the enthusiasm is contagious – from university halls to board rooms to research labs. Our challenge is to harness this wealth of energy and excitement to build a pathway out of poverty for millions of people around the world. The Global Business Coalition for Education, chaired by Gordon Brown, hosted a breakfast meeting to facilitated conversations between the business community and the education sector with the overall goal of more coordinated collaboration to improve education. 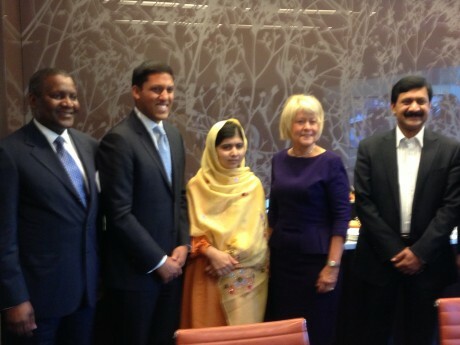 Malala Yousafzai was in attendance as a special guest and together she and Administrator Shah encouraged the business community to invest in improving educational outcomes, with a particular emphasis on increasing equitable access to quality education, especially for girls. Administrator Shah gave opening remarks at the Learning for All: Education Finance and Delivery event. This event was a follow-on to the high-level “Learning for All” Round One Ministerial Meetings that took place in April. Gordon Brown and the Global Partnership for Education invited the Heads of State, Education Ministers and Finance Ministers from a new set of six countries – Pakistan, Afghanistan, Myanmar, Timor-Leste, Somalia and Chad – to hold meetings on accelerating progress toward Education First. 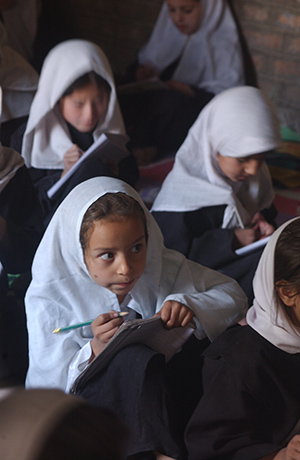 Of these, two of the focus countries (Afghanistan and Pakistan) were USAID “Room to Learn” countries. The meeting was attended by Ban Ki Moon, Jim Kim, Gordon Brown, Irina Bukova (Director-General of UNESCO), the President of South Africa, the President of Mozambique, and many others. As a part of the Learning for All meetings, Administrator Shah participated in the “Learning for all Pakistan” meeting. The Administrator expressed the USG’s continued interest in working with the Government of Pakistan and provincial governments to improve access to education and education quality. He also encouraged Pakistani government official to continue to show increased leadership and commitment to education. Malala Yousafzai also spoke and expressed the importance of education, particularly for girls, In Pakistan and worldwide. She encouraged the leaders in Pakistan to further increase spending on education and make secondary school compulsory. Yesterday afternoon Administrator Shah gave closing remarks at the Responsible Investments in Myanmar forum hosted by the Asia Society and McKinsey Global Institute. The forum discussed the challenges and opportunities of Burma‘s transformation and ways to foster sustained growth and development through responsible investment. The discussion centered on two reports — Asia Society’s Sustaining Myanmar’s Transition: Ten Critical Challenges and the McKinsey Global Institute’s Myanmar’s Moment: Unique Opportunities, Major Challenges.